Starting any new exercise practice can be discouraging, and it’s no different when entering into a CrossFit gym, which can be a nerve-wrecking experience. Although in the current sports environment everybody is talking about CrossFit, there are those who don’t even know what kind of sport it is. CrossFit is a complete and efficient training package. Created by Greg Glassman in the USA in the seventies, CrossFit started gaining popularity when the first CrossFit gym (called Box) opened in 1995 in Santa Cruz (California), before reaching its height in popularity after 2008.Today, there are more than 8,000 gyms and fitness centers spread around the world where CrossFit is performed. CrossFit is commonly advertised in four words as “the sport of fitness” with a combination of constantly varied, high-intensity functional movements. It can be thought of as a training philosophy that coaches people of all shapes and sizes to improve their lifestyle and cardiovascular fitness within an encouraging environment. A CrossFit gym is unlike a normal gym. There is only one work out, called “WOD” (described below), performed each day that is completely scalable based on your skill levels. How is a CrossFit class organized? Usually it starts with a warm up and mobility phase, which is conducted as floor exercises to activate different muscular groups in preparation for the workout. It’s important that this phase includes the use of small tools like foamrollers, elastic bands, and backballs for muscular massage. This phase is essential because it prevents injuries and makes the subsequent movements more fluid. Within this phase different exercises that will be in the workout are explained then performed (see Table below), including instructions on the techniques underlying specific movements. This phase represents the real workout. In this phase there is no time to sharpen your technique or to rest. Following the CrossFit principle of high intensity, athletes have to exert maximum effort in the given timeframe. Typically, this phase has different time periods of activity from five minutes up to 30 minutes. 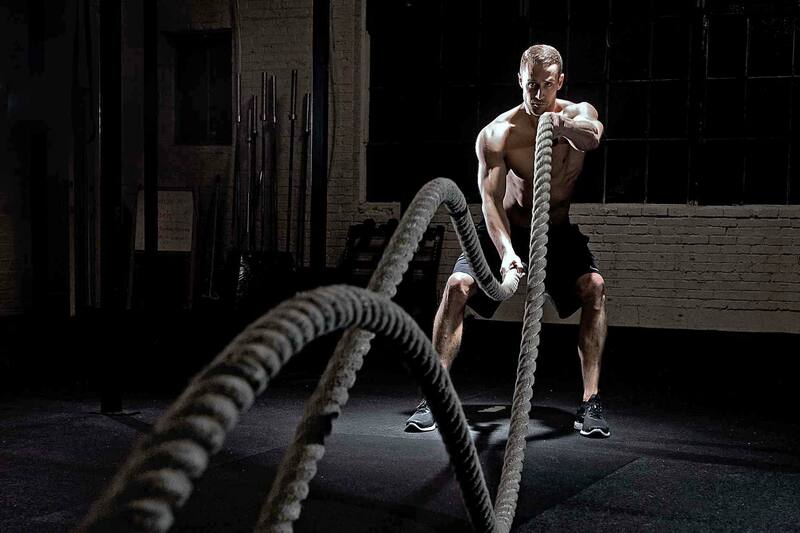 It’s considered the metabolic part of the workout, often called Metcon. This phase is dedicated to exercise recovery, muscular lengthening and cool down. Under coach guidance stretching exercises are conducted, with a general duration of about ten minutes. What are the CrossFit exercises? A fixed list of exercises does not exist, instead during the training sessions different disciplines are interchanged with different functions and characteristics (see below). In particular, CrossFit combines different sports and movements. You can move from weightlifting to gymnastic routines, or from cardio to running and climbing, amongst others. A variety of tools are used including barbells, medicine balls, rings, kettlebells, box jumps etc. It’s important to remember that CrossFit’s goal is not aesthetic, like bodybuilding, but rather aims to achieve a good health performance base. The improvement seen in the body is a pleasant consequence of CrossFit and not the sole purpose. Festival (St. Nicholas Plaza at St. Nicholas Avenue and West 135th Street) Shows start at sundown; seating area opens at 6:00pm. (East 120th to 124th Streets and Madison Avenue) Show starts at sundown; seating area opens at 6:00pm. Morningside Park (114th Street at Morningside Drive) Show starts at sundown; seating area opens at 6:00pm. Thomas Jefferson Park (First Avenue between 111th and 114th Streets) Show starts at 8:30pm. Sherman Kreek Peninsula Park (10th Avenue, Between Academy Street and the Harlem River) Shows start at sundown; seating area opens at 6:30pm. Sunday, Aug 28 – Inside Out (at Randall’s Island Connector) Show starts at 8:00pm. 103rd Street Community Garden (103rd Street east of Park Avenue) Show starts at 7:45pm. Pier I Picture Show (Riverside Park South – enter at 66th Street at the Hudson River) Shows start at 8:30pm; seating starts at 6:30pm. Bryant Park (behind the 42nd St. Main Library) 42nd to 40th Streets, between Fifth and Sixth Avenues. Shows start at sundown; gravel areas around the lawn open at 5:00pm (chairs and bench seating available); the lawn area opens at 6:00pm. At this park only – BAG CHECKS are made before entering. So you should know, seats and lawn spaces are are taken fast; it’s best to send a friend to hold space with a blanket EARLY. At Bryant Park (between Fifth and Sixth Avenues, from 40th to 42nd Streets) check out http://bryantpark.org/ for days and times of events. For adults and kids, there are games to play, such as chess, checkers, mah jongg, and board games, plus active sports, which include petanque (much like bocce or lawn bowling), ping-pong, and a putting green. Under a tent is the outdoor “Reading Room,” stocked with books and magazines for all ages. In addition, there’s an “Art Cart” in June, August, and September, with free supplies to use and artworks to take home. The park has three restaurants, food stands, and crafts and souvenir shops. There are coffee, pastry and deli shops all along 40th Street. If it’s too hot or it rains and the outdoor Reading Room is full, duck into the magnificent main library building, http://www.nypl.org/locations/schwarzman (for open hours), which has a very large but comfortable Children’s Library (with books, CDs, and DVDs for kids, and seven PC terminals), as well as a beautiful Map Room, a great shop, and a small café. And the youngest ones will thrill to the many, many inviting stairs to climb. In addition to a great playground and a “water wheel,” there are concerts, workshops in horticulture, and outdoor art for all ages, and, for kids, story times and “Art in the Park.” There is also a large outdoor plaza with tables and seating. Vendors are set up all around the park. (If it rains, I’ve heard good things about the Museum of Math at the north end of the Park (11 East 26th Street) http://momath.org/. 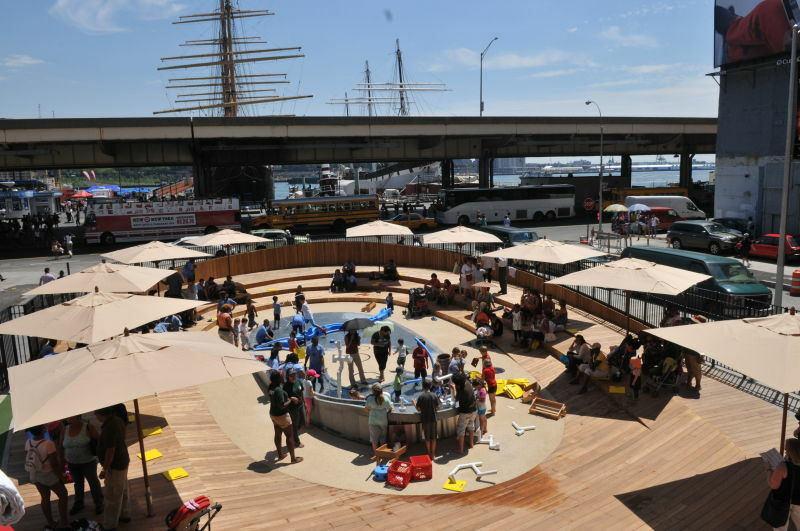 “The Imagination Playground” at the South Street Seaport at Berling Slip on John Street between Front and South Streets. In the months leading up to the World Cup, we kept reading headlines like “Panini Truck Heist in Brazil” or “Colombian Teacher Caught Stealing Students’ Paninis,” to which we thought: what the heck do sandwiches have to do with football? Then our Brazilian friend presented us with our very own Panini World Cup sticker book so we could join him in his quest to collect all of the stickers needed to fill its pages; Panini, it turned out, was a sticker brand rather than a sandwich. The goal of a Panini sticker book is simple: collect and stick on every sticker (there are 643 in all). There are several stickers related to the Panini brand, FIFA (the international football organization), and the World Cup more generally, including stickers for the 12 stadiums (each stadium is split into two stickers). But, most importantly, each of the 32 teams has a national emblem, a group photo, and a picture for most of the players (there are only 17 player stickers per team rather than the full 23, and these were from the players who were projected to be selected for the tournament, meaning some stickers are of players who ended up not getting selected to actually play). To start our collection, we bought seven-packs of stickers for $1 each at sports stores and bodegas around the city. Early on, almost every pack that we purchased was packed with stickers that we needed—it was fun! But as our sticker book filled up, we started getting a lot of duplicates, meaning each packet of seven had fewer and fewer of the stickers that we needed. It was time to start trading—and that was when things started getting really exciting. Crickets: From Midnight Music to Midnight Snack? “And how much is that per cricket?” I ask. I’m standing in front of the reptile cages of a local Brooklyn pet store. “Ten cents a pop.” Sounds reasonable. In a minute or two, the clerk has wrapped up the insects in a large plastic bag, the same way you’d take a goldfish home from the fair. They’re mottled brown and reassuringly lively, hopping frantically against the top of their enclosure like popping corn. As the clerk rings up my order, she jokes, “Salt, pepper, ketchup?” She doesn’t know just how close to the mark she is. These crickets aren’t for a pet lizard. They’re on tonight’s menu. It’s hard to think of a stronger culinary taboo than eating insects. Many Americans can barely abide the presence or even the sight of them, but billions of people around the globe regularly consume a wide variety of insect life. The reason is simple: insects are nutritious, incredibly energy efficient, and even tasty. 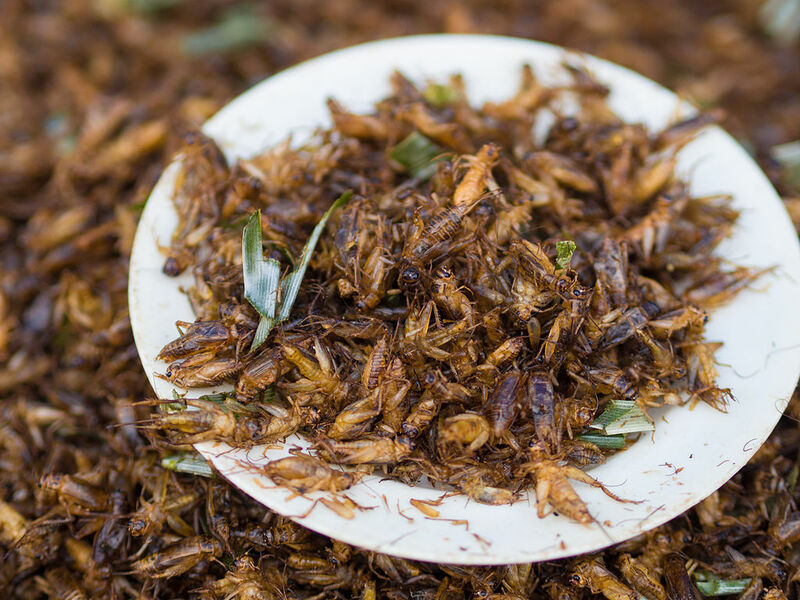 The reason that we all should eat insects is even simpler: it might help to save the planet. Our current system of global food production is not sustainable. A 2006 United Nations Food and Agriculture Organization report found that our present levels of meat production contribute 14–22% of the greenhouse gasses produced in the world in a given year. As the developing world continues to eat more like America does (i.e., much more carbon-intensive meat instead of produce), this proportion will only grow. The reason livestock like cattle are so ecologically deleterious is the inefficiency that comes with raising them. It takes eight pounds of feed to grow just one pound of beef. Insects, by comparison, turn food energy into body mass much more efficiently: a ratio of about 2:1 feed to body mass. And while producing livestock on a large scale requires “monocrops” of corn that themselves are harmful to the environment, insects can be fed on agricultural byproducts and other organic matter that would otherwise go to waste. Temperatures are rising and flowers are in bloom: summer is practically here. And for one month this summer, people around the globe will be riveted to their screens watching all the drama unfold in Brazil at the 2014 World Cup—the football (yes football, but soccer if you must) tournament that 32 countries have spent the last three years qualifying for. Remember how excited you were to watch the Olympics? Well double it, and that’s how the rest of the world feels. But if you can’t muster that much enthusiasm, this handy guide we’ve created should at least help you keep up with all the cool kids watching. So muddle some limes for a month’s worth of caipirinhas and grab your contraband caxirola, Brazil’s noise-making answer to the vuvuzela (imagine if a rattle and brass knuckles had a baby—they’ve since been banned from the stadiums after being used by fans as missiles), and let’s tuck in. For those of you who are total World Cup novices, there are eight groups of four teams each. Each country will play all three of the other teams in their group, and the top two teams from each group will advance to the knockout rounds. The top two from the group are determined by awarding three points for a win, one for a draw, and zero for a loss. 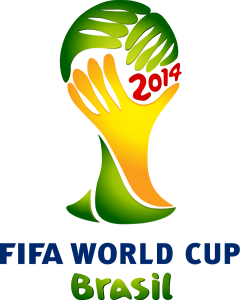 Google “World Cup 2014 Bracket,” print one out, and make your own predictions! Puerto Rico, “the rich port,” is an unincorporated territory of the United States. To us travellers from the US, that means that the currency is in dollars, our cell phones work and we need only a valid US license to travel there. San Juan is the capital. It is one of the most important ports in the Caribbean, situated on the northeastern side of the Island. 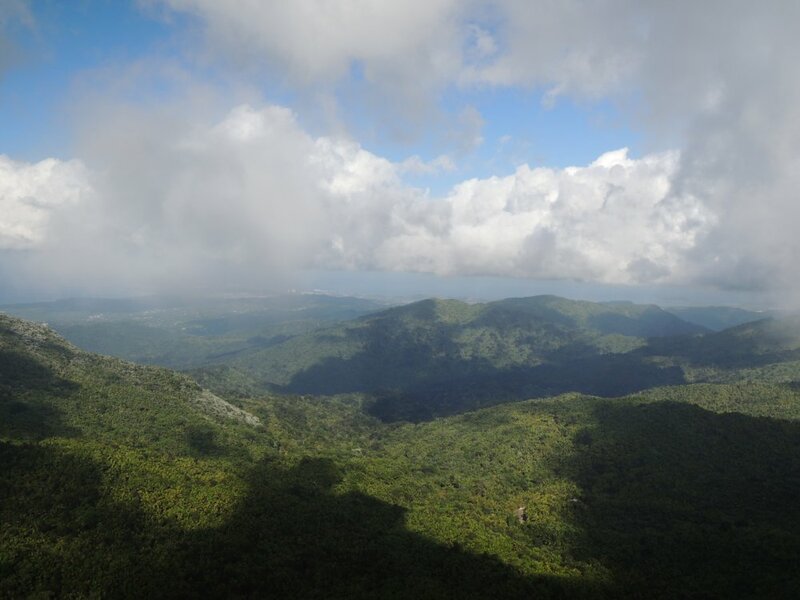 Aside from its beautiful beaches, Puerto Rico is home to the US’s only tropical rainforest, El Yunque. We took a seven day trip through this lovely island, and here’s a little of what we saw and did. It’s springtime in New York, and that means the start of baseball season. There is still hope in the air for the Mets, and great expectations for the Yankees, the two New York teams. Baseball is known as the “Great American Game,” illustrated by a commercial from about 30 years ago, which ran with the tagline “baseball, hot dogs, apple pie, and Chevrolet.” It is unclear exactly how American the game is. For many years it was a common belief that Abner Doubleday invented baseball in 1839 in Cooperstown, NY. The belief comes from the Mills commission, a 1905 report by the National League. 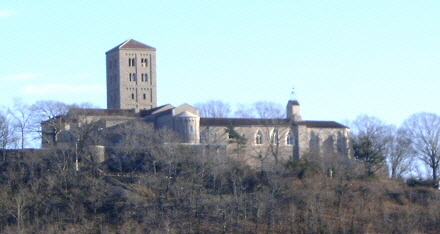 This was the basis for the location of the Baseball Hall of Fame. In recent years it has become known that this origin is a myth. Abner Doubleday was a Civil War general, but he was a cadet at West Point in 1839, and his family had moved from Cooperstown the year before. When he died, he left many papers and letters, none of which even mentioned baseball. 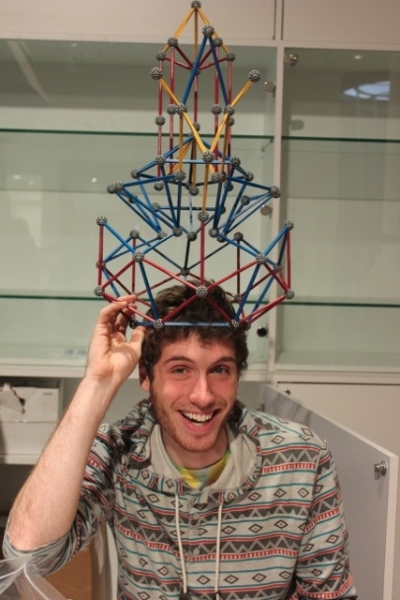 For Your Consideration – Crystal ball edition! Last year’s Crystal Ball edition yielded four of nine eventual Best Picture nominees. Gravity, American Hustle, The Wolf of Wall Street, and Nebraska as well as Best Picture winner, 12 Years a Slave, were all discussed as hopefuls long before they bowed. So if you think spring is too early to talk about Oscars, think again. Here are some films debuting this year that could wind up in the Oscar conversation as the year progresses. Why you might like it: Based on John le Carré’s novel, the film follows a Chechen Muslim as he gets caught up in the international war on terror after he illegally immigrates to Hamburg, Germany. Why I’ve got my eye on it: The film was discussed last year in this column, but its release was subsequently pushed back. Corbijn’s The American (2010) wasn’t able to best his debut, 2007’s Control, but I’m interested to see what he can do with a le Carré novel. Plus it has a lead performance by the late, great Philip Seymour Hoffman. When: April 5, starting at 2:00 p.m. When: April 5, 3:00 to 6:00 p.m. When: April 20, 10:00 a.m. to 4:00 p.m. When: April 22, 11:00 a.m. to 4:00 p.m. When: April 26, 10:00 a.m. to 7:00 p.m. When: April 27, 9:00 a.m. to 2:00 p.m. Most New Yorkers have heard of, if not been to, McSorley’s, a downtown bar. Popular belief is that it’s the oldest bar in the city, it even has sawdust on the floor. Many historical figures have patronized it over the years. It’s also famous for being one of the last to allow women. It had a unisex bathroom until recent years. 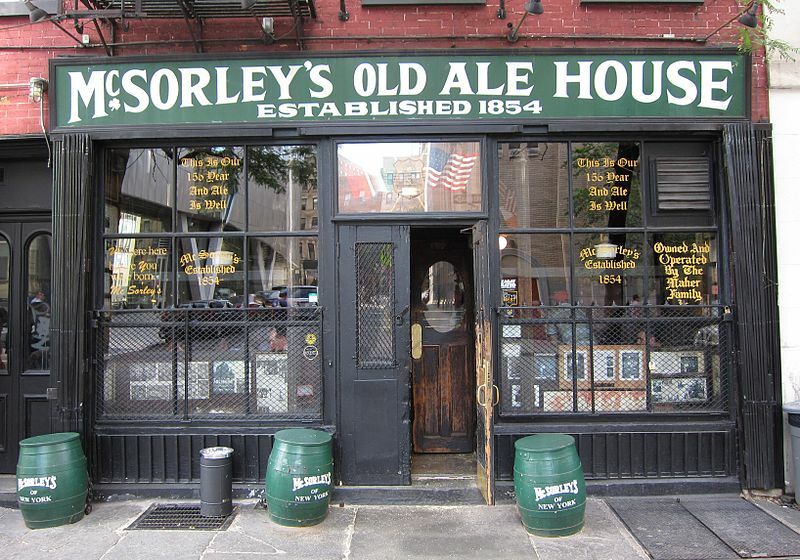 Officially, the name is McSorley’s Old Ale House, at 15 East 7th Street, in the East Village. According to the bar’s website, it was established in 1854 by John McSorley, a recent Irish immigrant. The original name was “The Old House at Home.” In 1865 the building was upgraded and John and his family moved in upstairs above the bar. According to city records, the address was a vacant lot until 1861. A writer for New York Magazine did some historical research and found it opened in 1862. The title of oldest continuously running bar in the city had been Bridge Café on Water Street, established in 1794. However, McSorley’s can claim to be the oldest Irish bar in New York City. In 1888, John McSorley bought the building. John’s son, William took over the bar in 1911. William sold the bar to Daniel O’Connor (in 1936), a longtime patron and retired police officer. O’Connor’s daughter, Dorothy Kirwan, inherited the bar when her father died in 1939. Since the pub did not allow women, she made her husband manager and only came on Sunday nights after it was closed. Dorothy’s son, Danny, took ownership of the bar in 1975. He then sold the bar to Mathew Maher, an Irish immigrant and friend of this father’s, in 1977. Maher still owns McSorley’s today. For both the hip and hungry, Brooklyn has been host to a growing new trend over the past few years: the food festival. The idea is simple: take the fun and novelty of a music festival or a craft fair, mix it with the kind of gourmet delights that foodies hunt the city for, and stir vigorously. You may already be familiar with the Great Googamooga (a seasonal food and music festival in Prospect Park) or Smorgasburg (an indoor/outdoor “flea food market” in Williamsburg). Both invite restaurants and vendors from all over Brooklyn to set up individual booths and allow visitors to sample some of the borough’s brightest culinary hot spots in one shot. The newest is Greenpoint’s Brooklyn Night Bazaar, and it’s easily worth a visit. George Barany is a Rockefeller alum (1977). Get here this month’s puzzle ! We all know that the third Monday of January was Martin Luther King, Jr. Day, the holiday established to honor the civil rights activist. But do you know how it came to be an official federal holiday? This writer can remember a time when the holiday didn’t exist. Martin Luther King, Jr., born January 15, 1929, was a significant civil rights activist in the 1950s and 1960s. King was an ordained Baptist minister and had a degree in sociology from Morehouse College in 1948 and graduated from Crozier Theological Seminary in 1951. After he completed his Ph.D. at Boston College in 1955, King became the pastor of the Dexter Avenue Baptist Church in Montgomery, Alabama. It was there that his history of civil rights activism began. In 1955 Rosa Parks refused to give up her seat on a bus, in defiance of local segregation laws. That spurred King to organize a city-wide bus boycott by the African-American community. Activists also challenged the bus segregation law in the courts. (The law was eventually overturned by the U.S. Supreme Court.) King went on to encourage more non-violent acts of civil disobedience. Martin Luther King, Jr. was known for this style of making protests without aggression, such as sit-ins at lunch counters. His efforts and those of others led to the end of segregation laws in twenty-seven cities. King’s most famous event was the 1963 March on Washington, which included his “I Have a Dream” speech and emphasized his belief that one day all Americans would be equal and live in harmony. In 1964, he became the youngest man to win the Nobel Peace Prize. King was assassinated in 1968 by James Earl Ray while standing on his motel balcony in Memphis where he traveled to support a sanitation workers’ strike. In the past couple of months, I’ve been to live concert performances in the major music genres of jazz, rock, and classical music. I found myself reflecting after each show on how these differing types of music are standing up within my own personal test of time. My brother graced me with a ticket to see jazz saxophonist Joe Lovano play at the Village Vanguard. I hadn’t been to the fabulous Vanguard in many years, but remembered it as a small and intimate space for a performance. After I insisted that we sit in the back of the club, my brother immediately guided us to seats just one table away from the small stage. And I’m glad he did. Mr. Lovano played with a fantastic group, consisting of a piano player, a bassist and two drummers/percussionists. His saxophone playing was on a virtuoso level as he hovered above us, and the songs were exciting and exuded an extremely positive vibe. Mr. Lovano also showed off great and complex chops on the flute and clarinet, literally wowing the audience, who at the end gave a very warm ovation, which was gracefully and gratefully received by the band members. Mr. Lovano’s unique, complex, somewhat traditional sax melody lines, and his unwavering power and emotion on the ballads, will remain with me. I had written jazz off as a past interest, but this wonderful show rekindled my curiosity in this difficult form of music. Like the old song says, the “city sidewalks, busy sidewalks” are “dressed in holiday style.” Besides the hustle and bustle of this busy shopping season, New York has many time-honored holiday activities. Here are just a few to help you feel that holiday cheer. 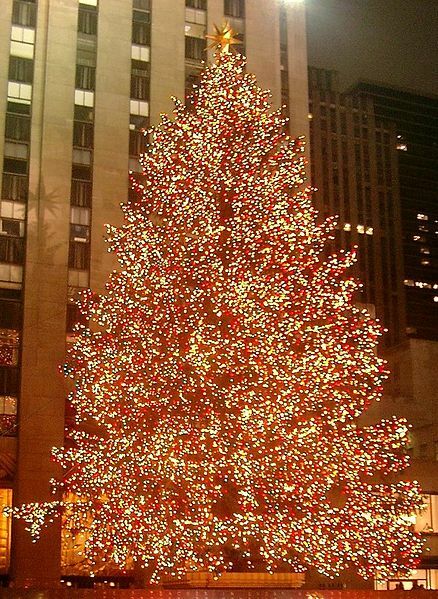 The gigantic tree at Rockefeller Center is an impressive sight for young and old alike. Every year, a huge evergreen is selected and transported to Rockefeller Center, on 5th Avenue between 49th and 50th Streets. It is set up behind the Prometheus sculpture next to the ice skating rink, strung with almost five miles of lights and topped with a Swarovski crystal star. The tree lighting ceremony is usually the Tuesday after Thanksgiving, typically with a few celebrities and a known figure skater. Even though the ceremony will have passed by press time, the tree is still lit daily from 5:30 a.m. to 11:30 p.m. except on Christmas, when the lights are on all day. The area can be very crowded with tourists, so the best way to see the tree is to go skating on the rink. Looking up at the beautiful tree and the tall buildings from the rink is an experience not to be missed. Admission is $27 for adults and $15 for children. Sessions usually last about two hours, starting from 8:30 a.m. to 10:30 p.m. Visit www.therinkatrockcenter.com for more information. With the fall film festivals behind us, we’re staring down the barrel of the Oscars’ gun and in a few short months, we’ll have our nominees. Still, it’s a long time until then on the campaign trail. So while the would-be contenders are out hustling and bustling, shaking the right hands and making the right appearances, let’s examine the Best Supporting Actor and Actresses races in the third installment of this three-part series. Quick—name how many wars are being fought in the world right now. At the time of writing, the Uppsala Conflict Data Program reported 32 ongoing armed conflicts. Is this fighting noble and just, or chaotic and deplorable? Are there good guys and bad guys? Unless we live in the midst of such fighting and struggle ourselves, our notion of war is directly tied to what we see in newspapers, magazines, and online. Our perception of war can be shaped by a single image, whether it is propaganda used to manipulate the public, or a snapshot of torture that shifts public opinion against war. So easily can our minds be swayed on matters of conflict; it seems we do not understand war at all. 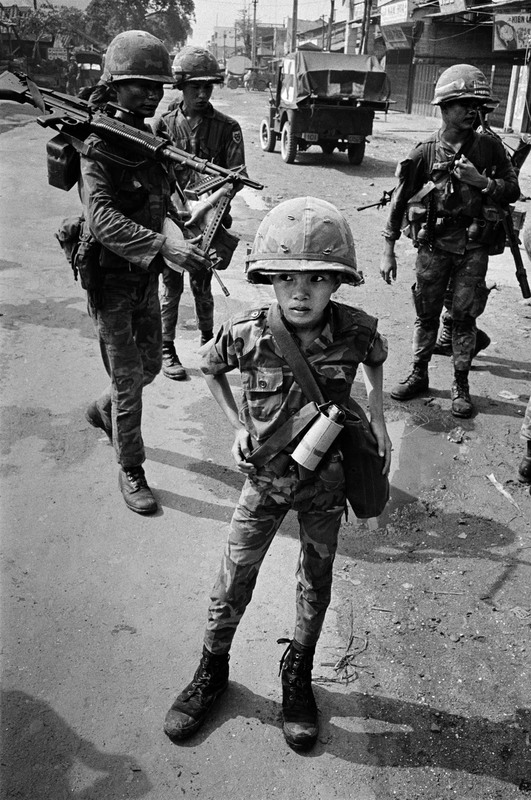 Perhaps it is impossible to grasp every dimension of conflict, but this lack of understanding is why an exhibit like WAR/PHOTOGRAPHY: Images of Armed Conflict and Its Aftermath at the Brooklyn Museum is so important. 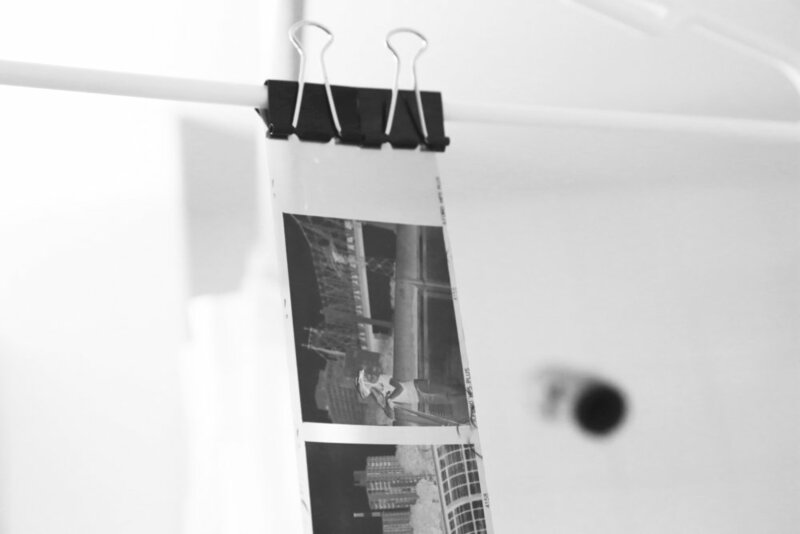 Medium Format Negatives Drying on a coat hanger.